Selling something balances you best in this world like nothing else would ever do and Sangkrit lets you get balanced by selling everything to change the world. 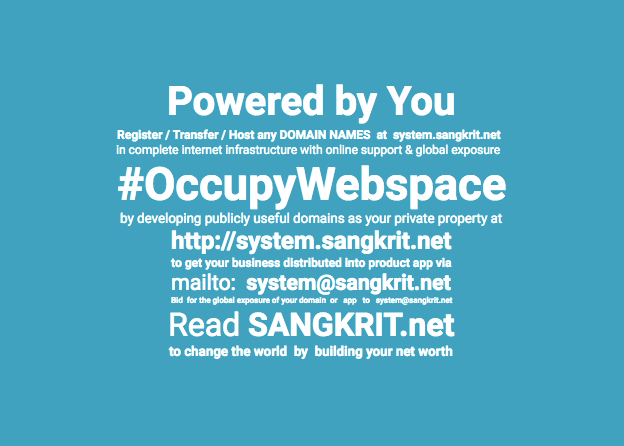 To start own business simply sign up for free SANGKRIT.net account. It is easiest and best for starting own business as an individual initiative and you become a personal outlet of a globally distributed order. Selling something balances you best in this world like nothing else would ever do and Sangkrit lets you get balanced by selling everything to change the world. Simply by cleaning your place, cooking your meals, programming your world and blogging your knowledge you may develop this into your domestic entrepreneurship for family business. You independently work as internet growth engine and make money by helping humankind in using internet infrastructure, online support and global exposure. Bringing everybody’s business online is sure to become the biggest business of internet age and procuring online support from system@sangkrit.net lets you easily expand that way. Doing that you help everyone around you. You get certified also for upgrading humanity into internet age.